Sunreef Yachts 102 ft luxury sailing catamaran IPHARRA, which launched in 2010, has already attracted an enthusiastic repeat clientele impressed by her styling, service, safety and stability. IPHARRA evokes a warm and romantic atmosphere throughout. Contemporary interiors in contrasting shades of wenge and anegre woods are enhanced by customized lighting and accentuated by modern, geometric furniture. A subtle color palette of beige, cream, and ivory creates a soothing balance that integrates design components. Breathtaking views are offered through charter sailing yacht IPHARRA’s magnificent wrap around windows in the spacious main salon, as ideally designed for a convivial cocktail party as for intimate conversation. IPHARRA comfortably accommodates up to 12 guests in five staterooms. Guest staterooms include the master with king size bed, two VIPs with queen size beds and two twin cabins. These roomy staterooms include first class amenities, individually controlled Bose audio system, LCD TVs, and ensuite facilities. On board IPHARRA, the fully equipped, professional galley with full size stove, fridge, dishwasher, and wine cooler, is the perfect spot to gather around to observe the chef’s creative cooking style and sample a delicacy or two. Luxury sailing catamaran IPHARRA offers plenty of exciting options to enrich the charter experience. Both sun worshippers and shade lovers can luxuriate on IPHARRA’s spacious flybridge. Here guests may indulge in a tropical cocktail from the well-stocked bar while relaxing on the large sofa and deck chairs for lounging in sun or shade. For guests who wish to try their hand at the helm on board elegant charter yacht IPHARRA, the navigation station is centrally located here and all maneuvering can be accomplished through high-tech hydraulic winches, bow thrusters and magic trim installed by the mast. From the flybridge, IPHARRA’s spiral staircase leads guests to cozy oversized sofas and a large, inviting dining table on the aft deck. This is the perfect venue for intimate dining al fresco or hosting a dinner party with as many as 12 guests. Imagine, watching the sun sink slowly into the ocean as the glow of twinkling LEDs magically lighst up the night. Luxury catamaran IPHARRA has an impressive selection of water toys to thrill charter guests of all ages. Don a pair of water skies to glide over the water, or explore below the waterline on speedy electric Seabobs. IPHARRA is also equipped with a sailing laser vago and two tenders that make getting to shore a breeze. IPHARRA is a very popular charter catamaran due to a superb layout, impressive styling, elegant interiors and unparalleled sea keeping ability. The highly skilled crew is focused on meeting the needs of every charter guest and providing an unforgettable charter experience. A charter on board IPHARRA insures guests a winning combination of perfect yacht and ideal crew. 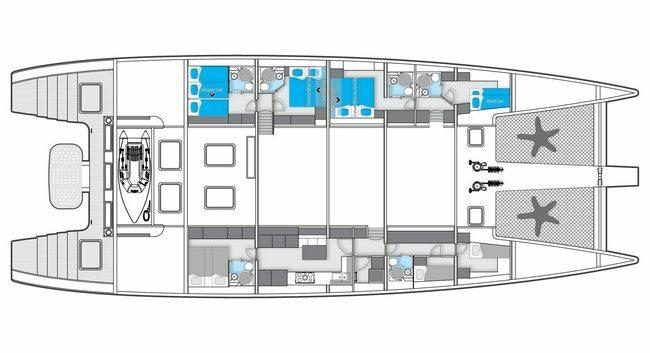 Ipharra comfortably accommodates in style up to twelve guests in five cabins. Guest cabins include the Master suite with king size bed, two V.I.P. cabins with queen size beds and two twin cabins. These cabins include first class amenities, private bathroom, individually controlled Bose audio system, LCD TVs, air conditioning. For a pleasant evening you can watch the latest films from the onboard DVD library on an outdoor home cinema screen on the cockpit with the sea in the back. The living room is the perfect place for entertainment in luxury, equipped with a multimedia entertainment system of the highest quality, including a 40' LCD television and Bose hi-fi audio system. The meeting & dining room is equipped with high conference table/chart table with display screen purpose-installed for business meetings and video conferences. The opposite side of the lower deck is occupied by a dining table with high chairs for up to twelve people. IPHARRA IS FITTED WITH A STERN HYDRAULIC ELEVATOR TO FACILITATE ACCESS TO THE BOAT. SHE IS EQUIPPED OF TWO TENDERS: A HIGHFIELD 5M80 WITH ENGINE HONDA 80 HP AND A BOMBARD AX COMPACT 500 WITH YAMAHA 9.9 HP. THE YACHT CARRIES A LARGE VARIETY OF SEA TOYS FOR ALL AGES.